Grass growing in the cracks of your drive or walkway can mar the appearance of your home and landscaping. This is a guide about solutions for grass growing in pavement cracks. This is sort of a garden tip. When doing your yard, mowing, weeding, etc. you find you have grass/weeds growing in the sidewalk. It is such a pain to crawl along or bend over pulling them up with TOXIC chemicals. Fill a sprayer with vinegar and go at it. A couple days after spraying, they will be dead! Just sweep them away! I find this works if I am spot spraying area of weeds in the yard. I do not like chemicals and straight vinegar helps with so many yard spots. Rinse your bottle out after use. Grass in sidewalk cracks? Plain old table salt will do it. Just pour a generous amount anywhere you don't want grass. Careful though it will kill most other plants too. How do I kill grass growing in driveway cracks? I've used a mix of equal parts vinegar and water in a spray bottle. I've also added a little bit of dishwashing liquid to help the mix stay on the weeds. Works well, they usually come back eventually, but it's easy to respray them each time. Instead of nuking the dirt every so often, getting trapped into a routine, go to your home center for a patching material and glue the cracks shut! I have been using plain boiling water. It really works. Have been doing this for a few years. How do I kill grass on the drive? I don't use any pesticides since I think they harm the earth and things that live on it. But I heard some folks use a small torch (either propane or a lit stick) to burn the grass. It doesn't come back they said. Mix and spray after dew evaporates. Never use harm full chemicals again. Sorry folks, forgot to put 1 gal. water in the recipe for weed be gone. If that is true, then why does the forest re-grow after a forest fire? We have a concrete floor in our garden, some of it is a foundation of a previous building and quite deep. There are several cracks in the concrete where there is grass and weeds growing. We want to put tiles on the whole floor, however we are not sure how to stop the grass and weed growth in the concrete for good. We want to be sure that the grass don't grow in cracks once we have tiles layered on top of concrete and eventually cracking the tiles too. 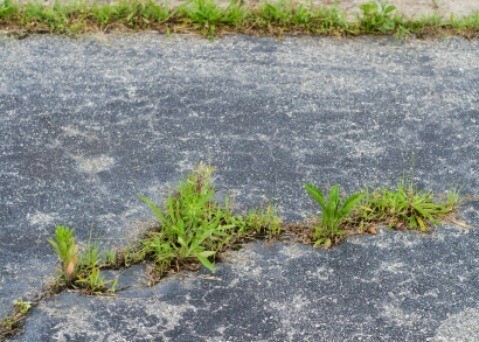 We are not sure using weed killer in the cracks will stop weeds growing in the future. How about laying a membrane on top of concrete and then putting another layer of concrete and then tiles, will that stop grass growing in the cracks ? A third suggestion was putting glue in the cracks, will that stop grass growing through cracks? We tried filling the cracks with some cement mixture, but the grass still grew through minor cracks. Any suggestion will be very much appreciated. Thanks in advance. You may need to try several things to get the job done. Spray or pour on straight vinegar, let that do its job. Then use something pointy, like a small hand garden trowel, to dig into the cracks and pull out that dirt and dried grasses. Then fill in with sand bought from walmart, or home supply store. Tamp down really hard. My husband has used this method, and then filled it in with that expanding spray foam sealer, then when it was dry, cut it off even with the surface of the concrete before putting down whatever you want to lay over. If you have pesky grass growing up through cracks in your concrete driveway or patio, just douse the grass with straight vinegar. It will kill the grass. With the weather warming up in my area I am looking for something to use on my driveway cracks where the weeds come up. Last year I used Triox, but it smelled horrible for days and I was wondering if there is anything organic that I could use to prevent anything from growing in the cracks all summer?